The sad truth of 2013 and beyond is that dedicated handheld gaming systems are fading out and much more powerful and capable tablets are taking over in the gaming world. However, with the literally hundreds, possibly even thousands of tablet choices, finding the right Android or iOS gaming device can be tough. Portable Platypus is proud to present a definitive guide to buying a gaming tablet that will remain relevant as technology advances. Below are the technical specifications that you should look for in a tablet that provide a good balance of price/performance/battery-life. Remember that these specs are what you should look for when buying a tablet for gaming rather than a productivity/multimedia device. Why Tegra 3 and not Snapdragon S4? For starters, Tegra 3 is a quad-core chip which many mobile games are taking advantage of these days. Tegra 3 also supports real-time physics and lighting bringing gaming on a tablet very close to the quality of console gaming. Of course, the selection of THD games on the Google Play Store is growing quickly as well. THD, for those who don't know, is the term for games optimized for Tegra 3. Shadowgun is a great example in which the THD version looks far superior to the standard version. But I can get a 1.8ghz Tegra 3 tablet for not much more money, why not get the higher clock speed? Simple, this is a guide that aims to give you the best price/performance/battery-life balance. Keyword there is battery-life. Literally every game in the Google Play Store will run great with no lag or dropped frames with a 1.6ghz chip, so there is no reason to go for a higher clock speed in the first place. Higher clock speeds will only drain your battery, not help with gaming performance at this point in time. RAM (sometimes referred to as memory) will be the least important factor to look into when buying a gaming tablet simply because 1GB or more has become the standard for most tablets now and that is all you need, but some budget tablets only have 512mb of RAM. If you're thinking, "Wait, my computer has 8GB of RAM and I can still barely play games at max settings how is 1GB of RAM enough for my tablet? ", the answer is tablet games are far less demanding because tablet hardware in general is far inferior to desktop hardware due to tablet hardware having to be miniaturized and have low power consumption. Since tablet games are less demanding, 1GB of RAM will do you just fine. Android is also a much simpler OS than Windows 8, therefore not being nearly as heavy on your RAM. If you see a tablet with 2GB of RAM don't pay anything more than you would pay for a tablet with 1.5GB of RAM because 2GB of RAM is complete overkill and there is no reason to pay extra for it. Let's be real, as nice as big screens are, gaming tablets are supposed to be portable. You may stumble upon premium tablets with large displays, but it is best to stay in the range of 7-10 inches. This is the screen size games are optimized for and this is the screen size that keeps your tablet more portable than your laptop. 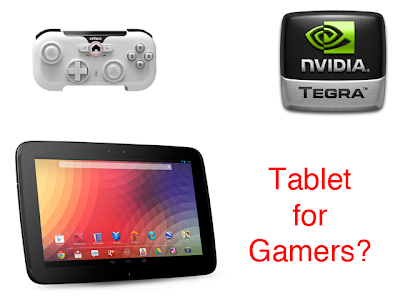 Neither of these are necessities for a gaming tablet, but if you are paying 300 dollars or more for a nice Android tablet you better be getting at least one of these. Mini-HDMI ports are really awesome for gaming tablets because that means when you get home from a long day of gaming on the go you can plug your tablet into your TV and play it like a console. SD Card slots are good because games can be pretty darn big in terms of file size, especially games like Nova 3 which are the types of games you will probably be playing if you are spending a decent chunk of cash on a high-powered tablet. Any tablet that is going to be playing graphically intensive 3D games needs at least 16GB of storage. This is pretty standard for most tablets, but you'll find a few black-sheep out there trying to rip you off by giving you only 8GB of storage. Like I said earlier, games are big. Do you really want to be able to hold only 6-8 games on your tablet at once? No, I didn't think so. Get at least 16GB of storage; you will not regret it. The good thing about buying Apple is that your choices are limited and streamlined. The bad thing about buying Apple is that your choices are limited and streamlined. When buying an iPad for gaming all you need to look for is that it has an A6X chip. This is Apple's new flagship chip that is super fast and beats pretty much anything else out there in terms of sheer speed of a tablet. This is the chip used in the latest retina display iPad. However, this chip is not used in the iPad Mini.